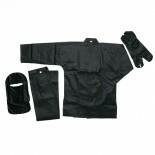 This traditional Ninja uniform is made of 100% cotton for optimum performance and comfort. Uniform comes complete with traditonal pants, jacket, gauntlets (with finger loops), and face concealing hood. The pants include double waist ties in addition to knee and ankle ties. The Ninja jacket features a hidden shuriken pocket. An absolute must have for all stealth missions. Size: 000-7 ..